Rev Dr Richard Waugh and his new book. Times photo Wayne Martin. 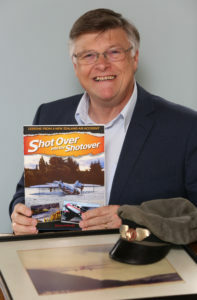 Erebus National Memorial initiator, airline historian, and aviation chaplain Rev Dr Richard Waugh is launching his latest aviation book, Shot Over into the Shotover – Lessons from a New Zealand Air Accident. The new book recounts an unusual accident involving his late father Brian Waugh with de Havilland Dominie ZK-AKT forced down into Queenstown’s Shotover River, due to engine problems. The subsequent intrigue involved engine reliability issues, an inadequate accident investigation and recounts how Waugh, a licensed aircraft engineer as well as an experienced pilot (with WWII service in No.75 (NZ) Squadron), happened by chance to inspect one of the engines being dismantled for overhaul. What he discovered led him to relentlessly advocate for a proper investigation. The late 1960s accident has continuing relevance for today’s aviation industry. The book includes hard-hitting commentary by several well-informed New Zealand experts, including a forensic engineer, a tourist airline operator, and airline pilots’ union president, who all question whether current New Zealand air accident investigation processes have improved enough over the years. Included in the Shotover book for the first time, is a short history of the origins and development of air accident investigation in New Zealand and insightful learnings from some controversial airliner accidents, including the 1979 Mt. Erebus accident. Shot Over into the Shotover will be launched at the MOTAT aviation hangar, Meola Road, Western Springs, on Sunday November 18, 7.30pm and at Tauranga Airport (Classic Flyers) on Wednesday evening November 21, 7pm. All are welcome. Contact: Rev Dr Richard Waugh QSM Ph 022 5339400 or 09 533-9400.